Those photos are of the scene after the "equipment bag" has been retrieved, and black gloves have been scattered. You believe your opion, others believe you are wrong.. The video is not definitive either way and that is with us having the ability to analyze and watch it.. Imagine being in that scenario and how chaotic it is.. I am not alone in my observation, be any means, and find myself in surprisingly good company! These kinds of threads are like juries, except we're allowed to do research and talk about the case before we've seen all of the evidence. Nevertheless, if this were a jury room, you wouldn't change my mind. Still waiting for an explanation as to why all those officers suddenly all started yelling "Handcuffs!" Every time we see an execution like this, and hear these lame excuses, cops lose more and more faith, trust and good will from the communities they serve. Too bad it takes a cop killing for them to get it back! My first screen grab of the object circled is at 1:03 - before she says "he better be alive 'cause..." and before the one officer asks the other to go to his truck for his bag. Watch the videos and try to put it together. 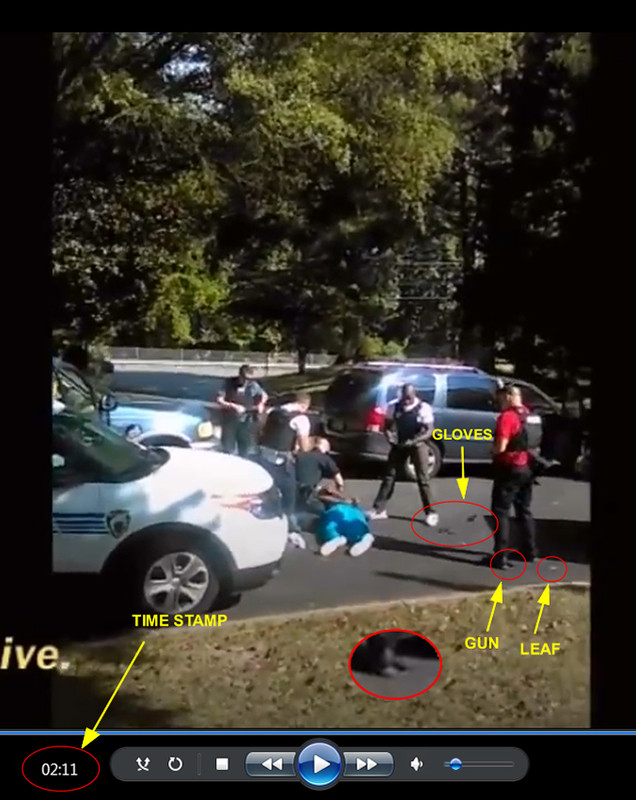 That picture is paused at the family's video at the 2:11 mark, when the gun magically appears. Gloves are already on the ground. 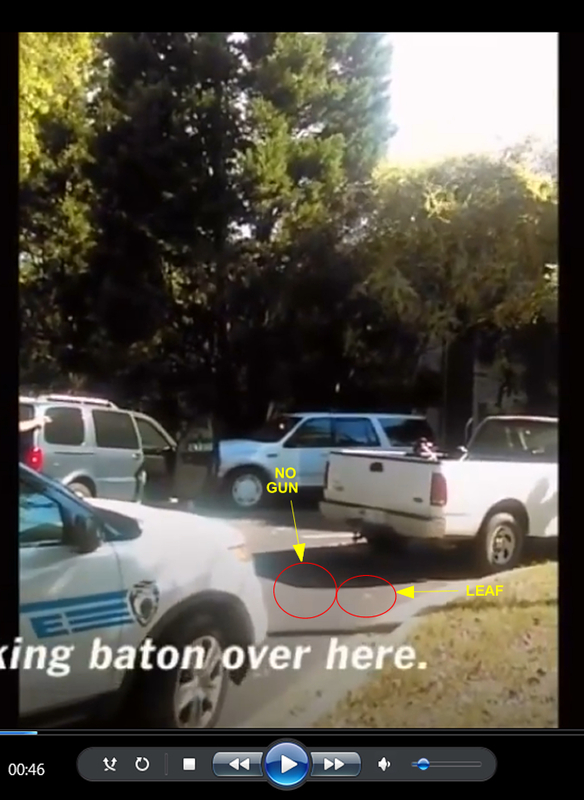 What's circled in red from 1:21 on in this sequence a minute before you claim the gun "magically" appears? 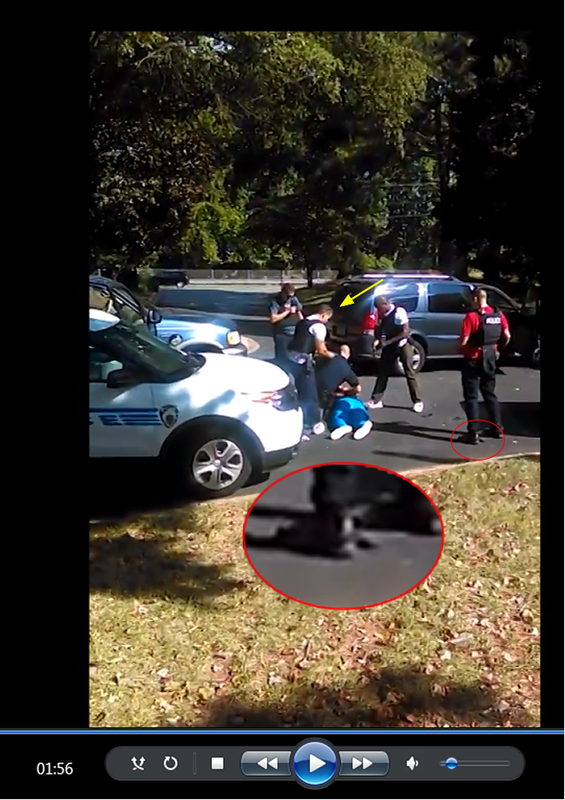 This is before the officer straddles the gun with his feet blocking the view. The gun was "planted" before the other officer gets his bag? This is before the gloves fall on the ground. Notice the gun? You can see in the video that the officer in the red shirt grabs rubber gloves from his pocket and it's tossed on the ground. No it isn't. Please provide the time stamp for this photo. It's after the gloves have been dropped, and just after Red Shirt guy leaned over and picked a glove and dropped the gun between his legs. You can see the gloves strewn on the ground in this picture. I don't know what video you're working with, because here is what I have at 1:56, and there's no gun there. Here's a still from 2:01. Gloves on the ground, no gun. Now let's talk about these, that are from when Mrs Scott first rounds the corner, just before we see Mr Scott on the ground. Is that a gun? 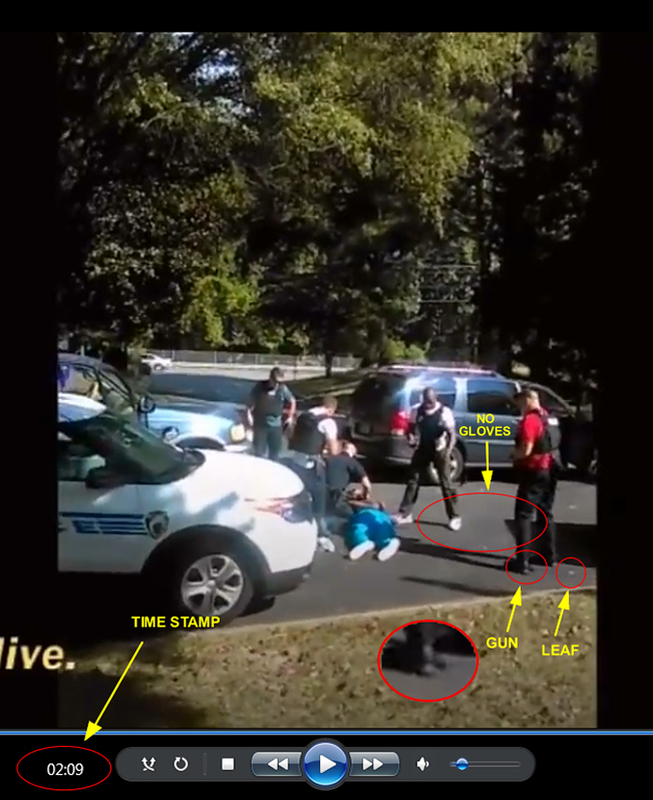 We saw Keith Scott crumple non-violently to the ground, his hands grabbing his belly. He didn't toss his gun away from his body as he was going down. If he had a gun in his hand, it still should have been in his hand, or under his body. We saw photos of his hands as they were cuffing him, and we saw no gun in his hand or under his body. 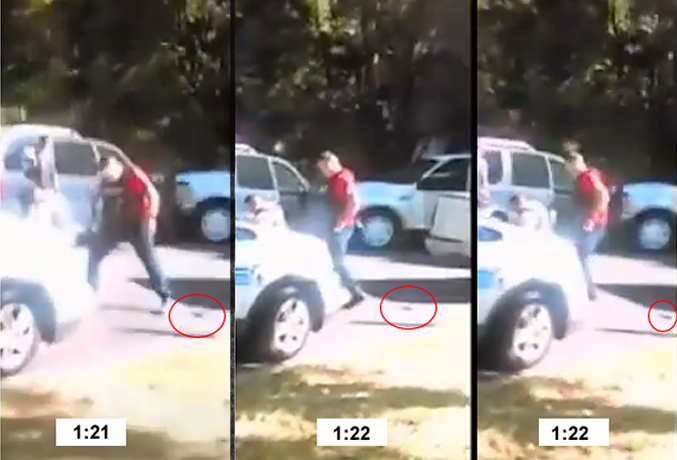 So, if that's the gun, like 3 feet away from his feet, how did it get so far from his body, so fast? Did someone throw it over there? The Dash Cam, nor the Body Cam reveal any such movements. Doesn't make sense. The gun is a plant. You can see it being dropped between, 2:09 and 2:11. For all I know, that spot could be a leaf, like several other leaves in the grass and other dark spots on the pavement, that give the same signature. The fact is, that spot disappears seconds later, as is evidenced in all the other pictures. This shot is frozen at 0.58. See the leaf reflecting white? Here's that same leaf at 1:21, same leaf, polarized to black. I believe what people are mistaking for a gun is merely a leaf. The solid gun object shows up at 2:11. In my opinion the officers signaled the need for the gun plant when they all started yelling "Handcuffs!". Then they started scattering black gloves all over the scene, for distraction. They all should be indicted! Disgraceful! Here's a close up of his feet. I have two points of reference for his left foot. The red - curb to the rear of his left boot. The yellow - leaf to the left boot. I CC&P'd both lines from the top screen grab to the bottom. 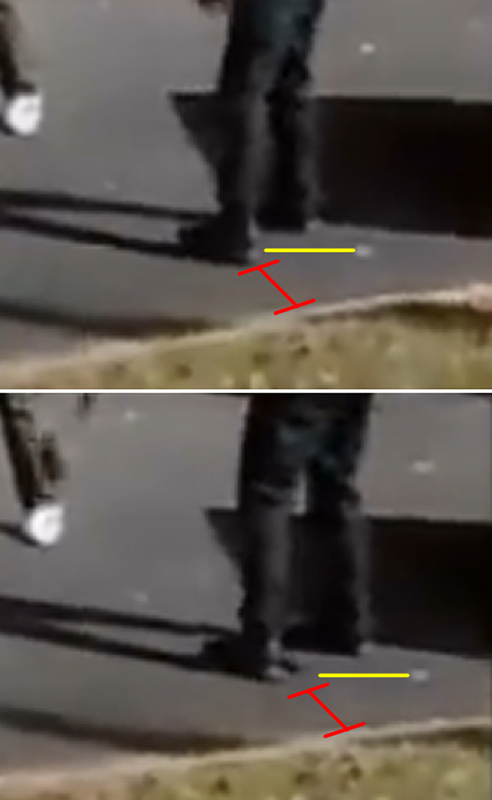 You can see his foot is at a different spot and has moved forward and to the left. This is a combination of the camera movement and his foot moving. This is the reason you can't see the gun at all times. Not because a gun was planted. I've already explained. When you watch the shoulder cam video, you see and hear the officer in the red shirt stoop down and grab something and push it between his legs. Then stand up and scoot it further away. 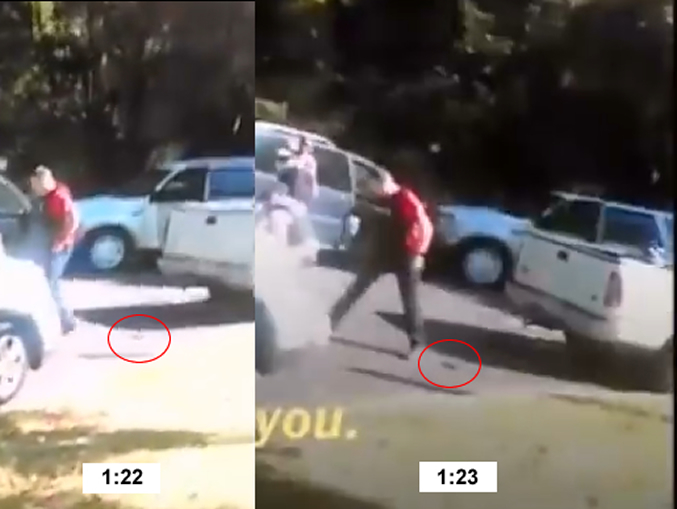 The sequence 1:21-1:23 I posted is after he stooped and moved the gun. At 1:23 you see him going back to the gun to secure it. In the video you hear off camera someone say "I got right gun... I got gun" after the officer is concerned the victim was griping his hand. What's that about? This is before the other officer goes to get the bag from the trunk. 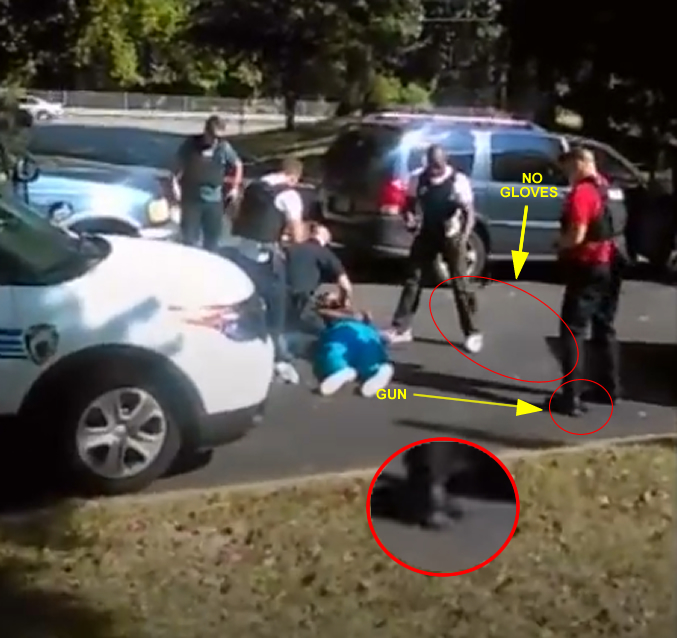 You see the officer in the red shirt purposely straddling something in the cell phone video. You see him move his right foot but not his left and come right back to the same spot. This is before you claim the gun was "planted." Why is he standing in the same spot? Protecting a leaf? Or securing the gun because he obviously can hear the woman in the background yelling and talking loudly? Knowing this woman is behind him and with all of the cell phone videos out, would he be so stupid to drop a planted gun between his legs? You're trying way too hard for some reason. Please use a little common sense rather than paranoia.